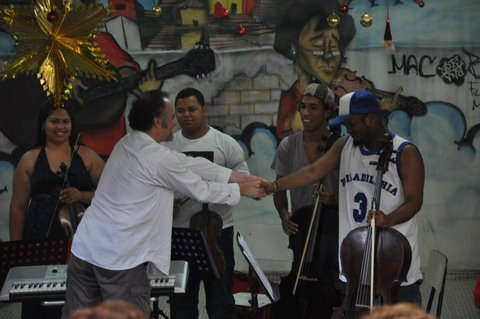 In 2010 ﻿Jozef Kapustka has spent several months in Rio de Janeiro (Brazil), working with the favela youth string orchestra Orquestra de Cordas da Grota conducted by Ubiratan Rodrigues ( read more about this extraordinary orchestra, created in 1995 by two Fluminense Federal University professors Marcio Selles and Lenora Mendes : http://www.arte.tv/de/1178008,CmC=1182598.html ). Intense music making sessions in the Grota favela lasted from November 2010 to January 2011 and were particularly dramatic: during this time special police units (BOPE) , Policia Pacificadora, army and marine have launched a massive military operation on the Rio de Janeiro favelas in what was later described as the worst drug bust related violence in the recent history, ultimately claiming more than 150 lives. The " Bach in Rio" project resulted in series of performances and recordings of selected Bach keyboard concertos, including in some of the prestigious central Rio venues ( Centro Cultural Justica Federal). MP3 files are available for purchase on all major on-line retailer stores. All benefits go directly to the Grota musical community in Niteroi, Brazil. MP3 files are available for purchase on all major on-line retailer stores. All benefits go directly to the Grota musical community in Niteroi, Brazil. I would like to express my most profound gratitude to all involved in the "Bach in Rio" project and who will recognize themselves here, in particular Marcio Selles, Ubiratan Rodrigues, Gilles Rabinovitch of Belize Conservatory of Music, Martin Voll, Tatiana de Albuquerque, Maria do Rosàrio Malcher; Cecilia Fernandez Conde, President of the Conservatorio Brasileiro de Musica http://www.cbm-musica.org.br/ , Prof. Ueslei Banus, Nayran Pessanha, Wilfred Paulse, Paulo Tarso, Prof. Francisco Frias and many others. Without their enthousiasm and generosity this project would have not existed. The video clips that you see on this page are exceptionnal documents that have been created in the context of extreme hardship. They would have not existed without the passion and the courage of artists that form the unique Orquestra de Cordas da Grota. 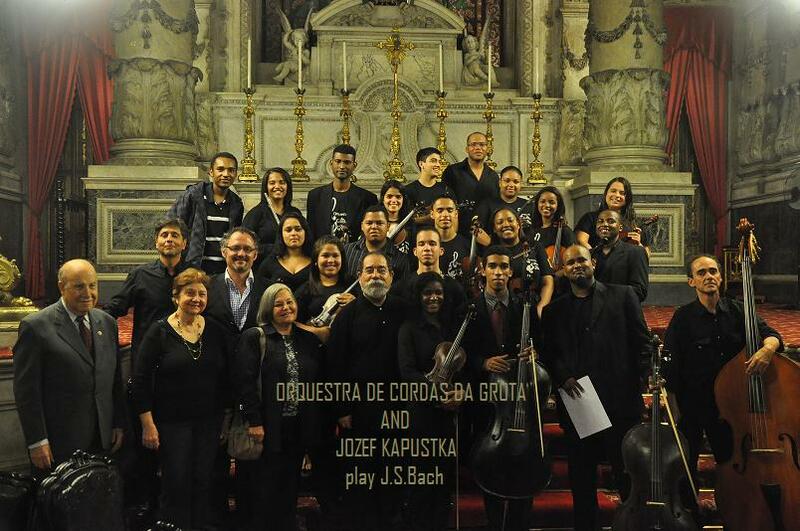 Queria exprimir uma profunda gratidao a todas as pessoas que se entregaram ao projecto "Bach in Rio" no qual se reconherao, bem Marcio Selles, Ubiratan Rodrigues, Gilles Rabinovitch, Martin Voll, Tatiana de Albuquerque, Maria do Rosàrio Malcher; Cecilia Fernandez Conde, Prof. Ueslei Banus, Nayran Pessanha, Wilfred Paulse, Paulo Tarso, Prof. Francisco Frias como a todas as outras. Sem o seu entusiasmo e jenerosidade,este projecto nao teria existido. The clip below has been competing to be screened during the 2012 Mostra of Venise opening days. Image source: Wilfred Paulse, Paulo Tarso, Centro Cultural da Grota, Google images. All images belong to their respective owners.